RUNNING FROM CRAZY is a fearless film made by two fearless women: legendary documentarian Barbara Koppel and actress Mariel Hemingway. It's the deeply personal tale of Mariel trying to open up the unspoken memories of her family: a childhood lived in the shadow of alcoholism, violence, mental illness and, apparently, in a new revelation, child abuse. These illnesses and disfunctions have of course played themselves out over many generations of the Hemingway family, with the infamous author and Mariel's grandfather committing suicide in the house next to her childhood home. But there's something desperately touching in seeing the very real family trauma that lies behind the iconic image of the larger than life literary giant drinking himself into oblivion. There's also something deeply admirable in Mariel's courage in speaking so openly, often showing herself in a poor light, in order to give her daughters context and hope that there is a way out of this so -called genetic curse. Koppel benefits from truly unlimited access to Mariel, lots of vintage footage of her sisters and parents, as well as contemporary interviews with Mariel's daughters and sister Muffet. I've rarely seen a subject so willing to be open and to let the documentarian shape the movie, even to the point of the shocking revelation of child abuse - one that I'd suspected watching the film and which seems to explain so much about the elder girls' obsession with their father. Her eldest sister Muffet is still alive but has spent her whole life in and out of institutions for some unspecified psychological problems. And Margot, was a supermodel who suffered substance abuse and eventually committed suicide. Koppel intercuts the linear tale of how these girls fared with contemporary footage of Mariel living her life with her new partner and her girls. The impact of her childhood is clearly seen, but we also see someone vital, and engaged, deeply loving toward her own girls and deeply involved in raising awareness about mental illness and suicide prevention. There's a marvellous and meaningful scene where we see Mariel really struggling to climb a rock, bare hands, and finally ascending. This documentary is a like achievement. Difficult, painful, but tremendously worthwhile. It deserves a wide audience. 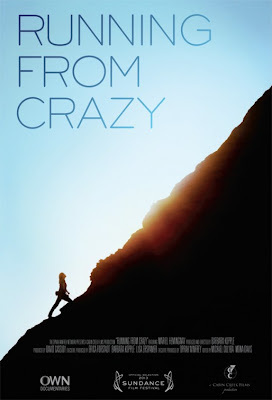 RUNNING FROM CRAZY has a running time of 105 minutes. It played Sundance 2013 and does not yet have a commercial release date.